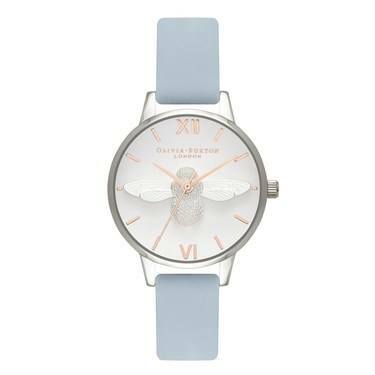 Create a buzz about your look with this beautiful blue watch from Olivia Burton. The brands signature bee takes centre stage in the dial of this elegant timepiece. Style with your favourite Olivia Burton bangle for a chic finished look. I love this light blue and white colour very much. It's quite special model of bee's series. Likewise, the size is absolutely suitable for my wrist. Excellent! Is it possible to have a mesh wrist band on this watch?